The Stack-A-Box modular storage system can be used just like any other storage box, in the home, office, garage and shed; and costs about the same price. The patented in-built system on the base of the Stack-A-Box modular box allows the containers to be stacked and easily locked together securely in place so that the tops of the boxes face outward, thus each box can be accessed through the hinged front door without re-arranging or dismantling the stack, reducing heavy lifting and saving time. A separate top shelf, or work top, is also available, giving the top of the stack a flat, horizontal surface for improved usability, like a desk or shelf. Easily Expandable To Add On More Units. 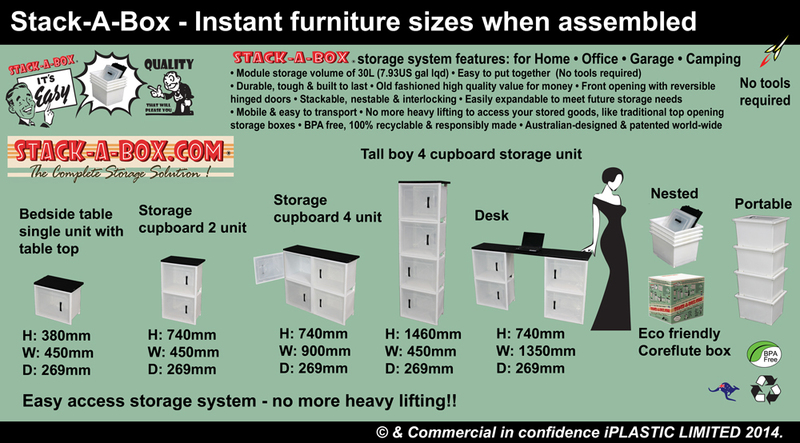 Portable – The Stack-A-Box set-up as a desk, cupboard or bookshelf is easy to take apart, without disrupting the contents, and is very easy to transport in a car, for moving house, office or storage shed. The Stack-A-Box modular storage system is a convenient, clean and attractive storage system that can be continuously expanded to suit your storage needs for the home, office, garage and shed. 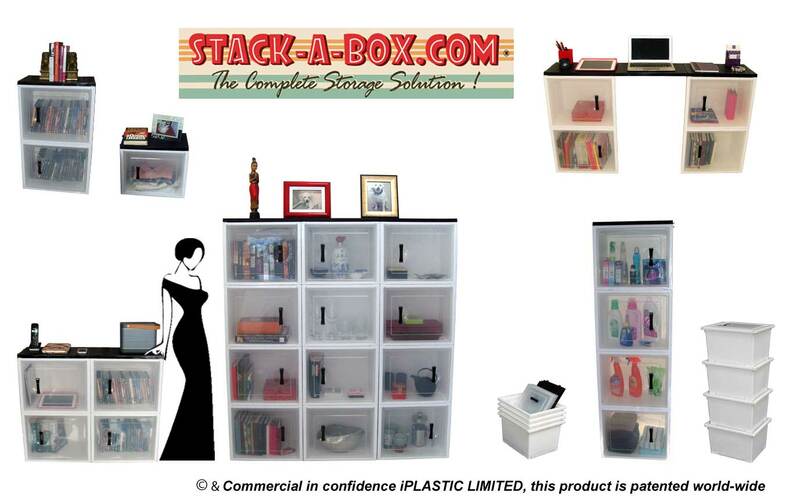 The Stack-A-Box modular storage system is made of tough high quality BPA free modified co-polymer BPA free plastic, unlike most storage boxes on the market, that do not last and break easily. The Stack-A-Box modular storage system is designed to nest into each other very efficiently for shipping, warehouse and POS storage; each box nests into each other with only a 35mm increase in size, (height). 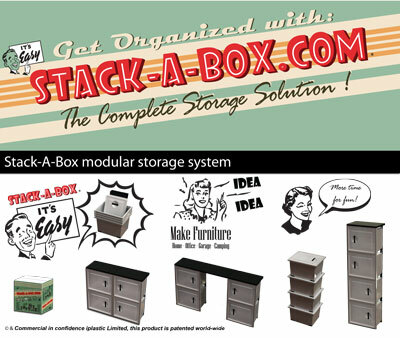 The Stack-A-Box modular storage system is great value for money. A high quality and versatile plastic storage box for home, office, garage and shed. The Stack-A-Box modular storage system can be linked together to make simple low cost furniture, such as desks, bedside tables, and shelves for the home, office, study, kids room, garage, garden shed and even camping. Stack-A-Box modular storage system is a versatile hi-value solution for storage applications with easy access, that is simple to put together. Stack-A-Box modular storage system: not just a plastic storage box, but a complete organisational tool. Standard plastic storage boxes, are hard to access the contents inside them when stacked up, are heavy to lift up and down, (bad on your back), and can be very unstable when stacked up high, generally they are also are made of very low quality materials that break easily. The Stack-A-Box modular storage system, has easy access to stored goods through it’s front door (no more lifting boxes), is convenient, strong and is an attractive storage system that can be continuously expanded to suit your storage needs for home, office, garage and shed. Get organised and have more time for the FUN things in life! Reduce Carbon Footprint – Plastic is more carbon efficient than cardboard and recyclable at the end of their long working lives, providing an ecological as well as economic modular box storage solution. Save Money – Plastic provide years of maintenance-free service and pay for themselves many times over their long lives. The Hi-rise Modular Box Storage Systems’ innovative nestable design saves valuable space on transport and warehouse space resulting in more efficient logistics. Hygienic – Easy to clean, Plastic does not absorb moisture or contaminants, and eliminates dust and debris. Tough – Made from tough and durable high quality BPA free modified co-polymer virgin plastic, up to 5 times tougher than what regular plastic boxes are made of. Protection – Smooth surfaces, free from splinters or staples, that protect contents and prevent injury. Stack-A-Box modules stack securely, eliminating the crushing associated with cardboard, low quality plastic boxes and other flexible packaging. Professional Image – A clean and attractive modular storage box solution for Home, office, garage and shed. Safety – Protect users from injury by securely containing their contents with the Stack-A-Box modular storage system, a world-wide patented secure stacking system with easy front door access. 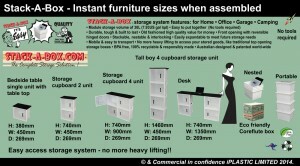 The Stack-A-Box is a quality storage box system for home, office, garage and shed.